Councilman Alan J. Gerson, Chair of the Lower Manhattan Redevelopment Committee and Councilman John Liu, Chair of Transportation Dept of the City Council, co-chaired a hearing on Chatham Square's reconstruction Thursday. 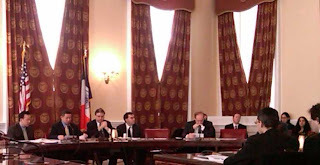 CCRC and members of the business and residential community were present to testify. The Dept. of Transportation, the Mayor's office, and NYPD made their case for the reconstruction of Chatham Square. John Liu at the very start of the meeting made it very clear that the presentation is accompanied by 12 pages of text and therefore he is limiting their presentation to 15 minutes in the interest of allowing everyone a chance to speak including members of various Chinatown groups and residents. The D.O.T. explained that they didn't want anyone to miss any of the details however they would try to paraphrase. 25 minutes later they were done - but not off the hook by any means. Gerson and Liu grilled the panel for well over an hour after their presentation. Early on in the hearing, while trying to understand the presentation being made by reps from DOT, Mayor's office, and NYPD Councilman Koppel of the Bronx took issue with the fact that he could not follow along with the presentation because he didn't have a map in front of him, he was provided with just text. This is what the Chinatown community had been saying all along. The City Council Chairs and members of the committee were denied maps and diagrams to accompany the presentation. After an embarrassing pause and a huddle, someone from the Mayor's office ran to find the nearest copying machine, this held up the hearing for some time. Apparently no one from DOT nor the City thought the Committee would find it necessary to have a map of the plan, despite the fact that they are accepting bids on it in two weeks. A $50 million ,four year long project at the most crucial intersection in Lower Manhattan should have been explained with accompanying maps, especially at a City Council OVERSIGHT HEARING. Maps? who needs maps? On previous occasions CCRC asked Seth Meyers of the Mayor's office and Pauline Yu, from the Mayor's Community Affairs office (ironically) if handouts could be provided to accompany their presentations. Apparently neither individual could carry out this simple request, not even for the City Council. At Community Board hearings and at a public hearing on Dec. 2nd 08 members of CCRC had to provide maps and documentation for the community so they could follow the one hour long presentation. Councilman Liu made it clear that he does not agree with the premise that Park Row will for ever be closed. It could be something as simple as a change in administration that could change this (of course with appropriate security measures in place). According to the DOT they didn't make the plan with the concept that Park Row will forever be closed, in fact the DOT said "Park Row can still function if it is reopened - although it will NOT function to the capacity it originally did." Gerson made the point that it is not necessary to narrow Park Row - and in fact it should not be narrowed if everyone accepts the premise that Park Row MAY in fact be opened at some point in the future. He determined through his line of questioning that there is no legitimate reason to close the width of Park Row by half. John Liu questioned for some time WHERE the actual "order" was made for Park Row to be closed. He "grilled" the NYPD for some time on precisely WHO made this decision, and who signed a piece of paper that says Park Row must be closed. During the hearing actually asked the panel to produce the document that reflects this executive order. It was very interesting that no one had this answer, nor a document to point to. You would think that there would be a single person responsible and fully accountable, but lo and behold there was not a single name to be associated with this closure. "We have to get back to you on that" was the answer provided by NYPD. Once it was established by Liu and Gerson that Park Row was closed "for security" the Councilmen held up a report that explained that after the first attack on the World Trade Center it was proposed that Broadway be closed permanently for "security" reasons. They went on to say that it was D.O.T. who stepped in to oppose this closure, even in the face of "security" concerns. Broadway remains open despite several federal court buildings, City Hall, and F.B.I. headquarters adjacent to it. Gerson said loudly "this smacks of a double standard" being applied to Park Row's closure. Councilmen Liu and Gerson had copies of the LMDC contract. They asked the DOT when precisely did the Chatham Square Plan get posted to any City agency website. After another huddle the answer was "we don't know the exact date". This was not acceptable to Councilman Liu and he pressed further. After more prodding "late november of 2008" was the best the panel could offer. (In fact the date was Nov. 26th 2008) Chinatown business owners vigorously demanded to see all of the Chatham Square plan on line at a DOT presentation on Nov. 25th 08, the answer at that time by the DOT engineer making the presentation was "it's not my department, but I will look into it, I can't tell you when that will be made available." Within 24 hours the full presentation was made available on the D.O.T. 's website. Had the Chinatown community not demanded this information be made available to the public who knows WHEN they would have made it available if at all. It was later determined by Councilman Liu, while questioning CB3's District Manager Susan Stetzerand Transportation Chair David Crane that Community Board 3 had .pdf files of the plan available to them "sometime in Oct. of 2008". These were not made available to the public, nor were they made available to members of the community board itself, nor to public members who could have disseminated the information conspicuously into the community. In particular CB3's volunteer outreach committee members Jeanie Chin and Jan Lee were not notified that CB3 had the final version .pdf files of the Chatham Square plan in Oct. 2008. By the time the plans became available it was only a little more than eight weeks prior to this hearing. Bids for the project are going out two weeks from today. The DOT and the Mayor's office contend that manifestations of the plan were available through the Environmental Impact Statement for Park Row ( a result of a lawsuit brought about by CCRC). Councilman Gerson made it very clear that the E.I.S. for Park Row has no mention of Chatham Square in its title and that Chatham Square is a part of the E.I.S. and not its main focus thus making it difficult to find if one were searching for detailed plans of Chatham Square's reconstruction. CCRC is quick to point out that the version of Chatham Square's reconstruction in the E.I.S. is included as a proposal only and not a "done deal" as it is presented at today's hearing and the hearing of Dec. 2nd 08, where DOT Lower Manhattan Commissioner Luis Sanchez exclaimed "we're moving forward with the project" after sitting through three hours of public testimony opposing the plan. At some point between the publishing of the E.I.S. for Park Row in 2005, and the Oct. 2008 time frame a "FINAL" version of the Chatham Square alignments and overall street plan was made without community input, and again without ever providing handouts of the plan at any presentation. What took place to finalize the alignments and street configuration was done so behind closed doors with only the Mayor's office, NYPD and DOT present. The DOT and Mayor's office claim that their process has been "inclusive of community input" yet the community, prior to Nov. 26th 2008 had no possible way to access the plans in their current "final" form. It is of NO use, even if one could find the E.I.S. documents buried deep within the NYPD website, that contained some version of the Chatham Square plan, because those diagrams and proposals are vastly different than what has been presented AFTER Nov. 26th 08. Councilman Gerson continued his questioning "when exactly, what is the date that you provided the chatham square plans with accompanying documentation to the public libraries in the area?" . Silence. A huddle. more Silence. Councilman Gerson "it's not a difficult question, what was the date that you dropped off the documents to the library? There's even a branch of the NY Library called The Chatham Square Branch. When did you drop off copies of the plan there?" No answer. "In fact you never did drop off copies to any library, did you? My Chief of Staff checked in with the librarian and she said you never dropped off anything. It says in the LMDC contract that you "must provide documentation to local libraries" and you've not done that." Again, this underlines the lack of respect that the DOT has for a community it is about to tear apart. In violation of the LMDC contract they plow ahead. Without providing copies to the community they plow ahead. Without making the plans available on line, they plow ahead. We commend our councilmen for exposing this injustice and for exposing the DOT for what it is. Members of the Chinese press also demanded to have copies of the presentations prior to Nov. 26th and none were provided. In fact there has never been an attempt to provide for any form of translation, no documentation has ever been published in any form in Chinese describing what is about to happen to Chatham Square. Despite a budget of $50 million, paper handouts for libraries, and translations of the plans in Spanish and Chinese have never been provided. What does this say about where the money for this project is being spent? I attended this Oversight Hearing, and, to their great credit - Councilmembers John Liu and Alan Gerson asked salient, pertinent questions - and some simple questions - to the DOT/Mayor's office, and they simply did not get any satisfactory answers. The City and DOT did give a lot of "We'll get back to you" type responses. 1. The City/DOT are trying to use an Environmental Impact Statement (EIS) for Chatham Square, when in fact that EIS was done for purposes of the NYPD's "Security Plan" for Park Row. What needs to be done, before any consideration of construction at Chatham Square is that there needs to be a separate EIS for Chatham Square Redesign. A Chatham Square EIS would require a Pedestrian Safety Study, and, an Economic Impact Study - both of which are lacking in the NYPD's Security Plan EIS. Brian Ketcham, traffic expert hired by CB3, has asked about these studies as they pertain to the Chatham Square Reconfiguratoin, and he has yet to get an answer. 2. The DOT and City ARE in violation of the LMDC contract which specifically states that plans of this nature are to be posted at local libraries. This obvious violation is an insult to the Chinatown community and warrants further investigation. At the least, the Chatham Square Reconfiguration should be halted in its tracks until a thorough Chatham Square EIS is completed (1., above). 3. Regarding the upcoming necessary Brooklyn Bridge work - weeks ago, at a Community Board 3 Chatham Square Redesign meeting, a local Chinatown resident first proposed free Battery Tunnel tolls during the weekends of Brooklyn Bridge work. This is a simple and obvious mitigation to prevent overflows at the Manhattan Bridge during these weekends. No one from the City or the Dept of Transportation has proposed this idea - and these people are supposed to be "professionals" paid for by tax dollars?